This past weekend Harley and I had a great time working with the horses. During the summer Tom and Charlie have been his reliable veteran team that helped with making hay. We just didn’t have time to experiment with his other two horses. But this weekend we first ground drove Babe with Tom and then put them to the sled. Having an extra person on the ground that can help Babe understand her task is extremely important. We drove around the yard for a bit and then things were going smoothly so we headed down the trail to the hay field. I stayed on the ground ahead of the team, one to open gates and two to be there for Babe, if she was hesitant. Babe has been through training, but it has been awhile and we didn’t want to assume anything so we started with the ground driving which she accepted, so we put her to the sled. We thought that she would be ready for a test of helping Tom take a load of firewood up to the house. We did not overload the sled with wood as it is a bit of a climb up to the house. I was on the ground with her lead rope in hand as I had to encourage her to help Tom get the sled up the hill. She stood quietly while Harley unloaded the wood. I stood at her head and praised her. We took another load up to the house and thought it was a good day for Babe. Next we ground drove Charlie with Shorty. Shorty is seven and has done field work a few years ago. He has a very short tail and is not as big as the other horses. He can be excited at times and we thought Charlie’s laid back personality would have a steadying effect on him. The ground driving went well and we put them to the sled. Our goal with them was to haul a few large rocks into the front yard to finish a landscaping project. The pair took the sled up the road to the house and stood quietly while Harley unloaded the rocks. I was at their heads making sure they stood. Shorty did really well and remembered his job in the team. Sunday it was dry enough that we could start mowing Harley’s last hay field. We put Shorty with Tom. Tom is on the right as he handles the turning extremely well. Shorty is smaller, but energetic and kept a better pace and helped Tom more than Charlie does. Harley was pretty excited to have a more forward PAIR of horses on the mower. Since Shorty does not have the condition on him, I caught Charlie and we put him with Tom to finish the rest of the field. 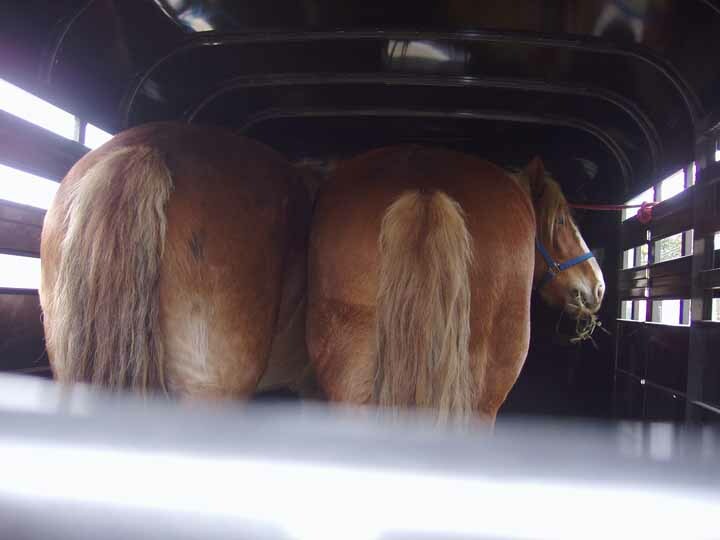 It just doesn’t help to overtax a horse that is not fit. You must take it slow and build him up. It was a warm day too. Monday came and Harley put Babe with Tom to ted the hay. It is easy work and she did okay. With more experience she will do the turning better and have better condition. She didn’t mind the tedder behind her either. Recently Harley switched Tom and Charlie by putting Tom on the left and Charlie on the right. It helps them to think and hopefully develop their muscles more evenly. We are excited with the flexibility to use all four horses for different jobs and in different positions. So this fall and winter we will have fun mixing and matching horses and driving them to keep and get some condition on them. We want to work three abreast also. With another year of experience behind them, we could even think about putting a four up together. Wouldn’t that be a grand time!!! 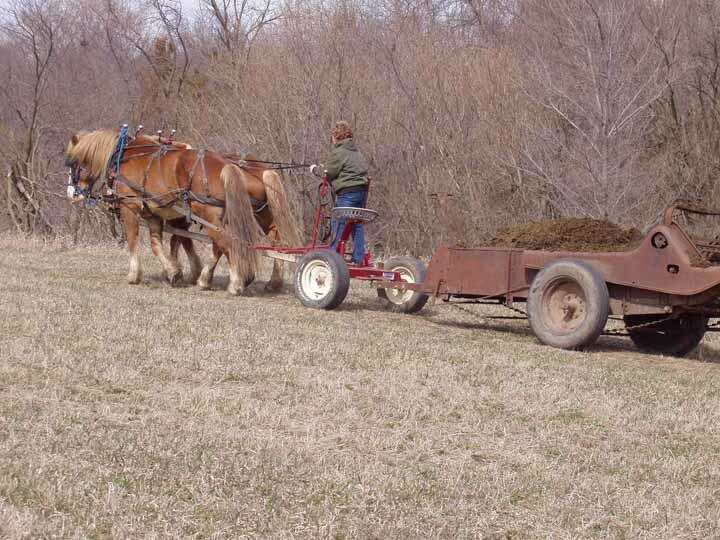 This past weekend the weather was great for getting some manure hauled with the horses. Harley used his veteran team Tom and Charlie with one load on Wednesday and with two loads on Thursday. I was there to help him on Friday. We took one load out and it is about a mile to the field and the road has a couple of hills on it. 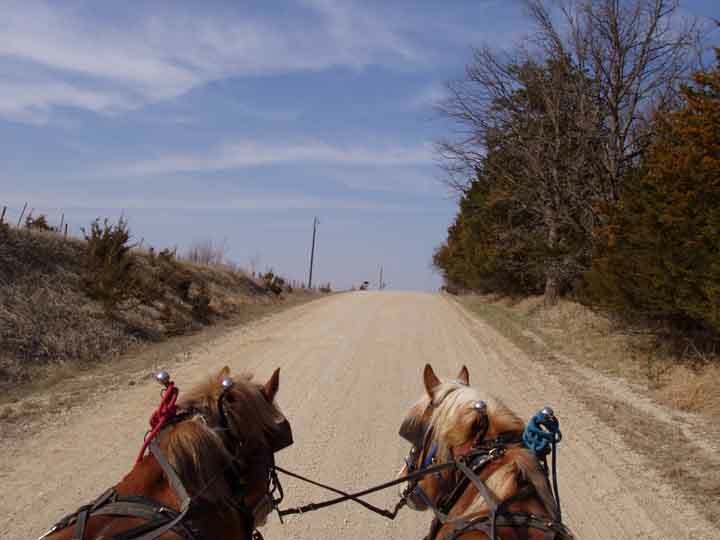 Harley asked the horses to stop on the crest of a hill on a flat spot so the horses would not need to hold the load. They stood quietly and we could see that the respiration rates of the horses was quick and shallow. To see respiration watch in the flank area and you can see the in and out of the flank as the horse breathes. Not sure how long we stood there, but waited until the respiration rate slowed. We rested the horses again once we were in the field as we had some grades to pull up and down and we had full load of manure. Once we got back to the barn and parked the spreader, we unhooked the horses and tied them to a post while we loaded the second load of manure. It is a tight area and thought it would be safer to not have the horses so close to the skid steer. Before we took this load out we offered the horses some water. They drank. Harley asked about them drinking water with the bit in their mouths. Horses will figure that out and it is better to offer water than to skip it. So Saturday we went for a six mile tour with Harley’s Prairie Schooner along the Raccoon River Valley. The wagon weighs about 1600 pounds with us it using the same pair. I was in charge of applying the brake on the downgrades to make it easier for the horses. Here again we would stop after the horses had climbed a hill to let them breath. I could apply the brake so parking on the level was not as critical. 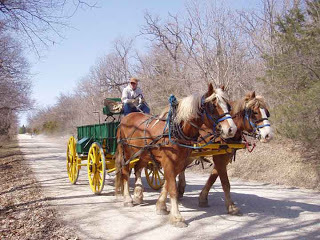 Tom is the more aggressive puller of the two horses and he seemed a bit upset with some of the noises of the wagon or brake and external noises. We need to work on some of that desensitization and refer back to Walt’s blog entry on January 12 about noises. As we headed back to the farm, we had a very long grade. The question was do we let them rest half way up and will they be able to start the wagon again or do we wait until we have arrived at the top of the grade. We thought it would be safer and easier for them to continue to the top. All the decisions that we make as we work horses depends on their attitude at that time and if they are acting normally and not over tired or stressed. The more you drive horses the more you know them. With ay to day work you get a good sense of what that horse can handle, because of how he handled previous work. But if you have not done the day to day progress then you should be more conservative. I would rather say at the end of the day that the horses did their work well than have to say I have pushed them too hard today. For me each outing with the horses is an experience to learn from as you are always making decisions and always need to be paying attention and driving the horses. Driving in that you have rein contact and they know you are the leader. It is your responsibility to be aware of their physical and mental boundaries for that day and to build on those and improve. It was a beautiful tour to see the trees and the forest floor and to see the river valley. 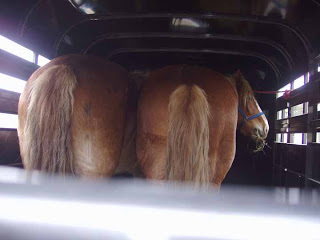 Once we arrived back at the barn and unharnessed, we loaded both of the horses in the trailer and fed them hay. They need to get accustomed to the new trailer and the loading and unloading process. You can do that in small steps weeks before you want to haul them which will make the trailering a good experience for them. What always assures me that the horses took the day okay is the fact that they are hungry and ate the hay aggressively at the barn. The more you work with them the more you know what is normal and what is not normal. With the way Tom was acting on Saturday, Harley thought it would be a good idea to drive on Sunday also. We took a shorter ride that was less challenging. Tom seemed more settled and it was more relaxing for him. Harley and I talked about our weekend and the good points and the things we want to work on with the horses. 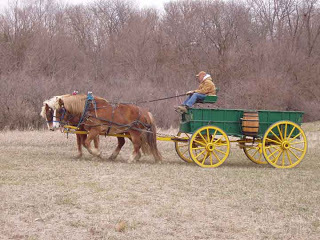 We are looking forward to our future days with the team whether it is a tour with the wagon or some type of field work.